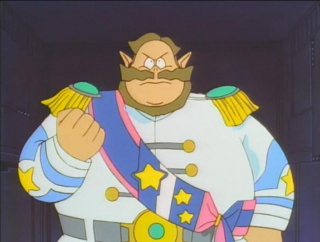 The President of South Island plays a somewhat minor role in Sonic the Movie. He is shown to be a compassionate person who cares a great deal for his land and also for daughter, Sara. He is voiced by Edwin Neal in the english dub and by Yuzuru Fujimoto in the Japanese dub. When he and his daughter, Sara, are taken hostage by Robotnik and he sends one of his aides, Old Man Owl, to summon Sonic. When Sonic & Tails arrive Sonic goes after Robotnik but is stopped by the President. The President pleads with Sonic to listen to what Robotnik has to say. After the conversation the President pleads with Sonic to do the task which Robotnik asked to be accomplished, because it will prevent the destruction from occuring and Sara pleads with Sonic also. Sonic agrees and he and Tails leave. Shortly after, Sara and Robotnik also leave after Sara accidently launches one of Robotniks mechs (Black Eggman) while they were inside it, and the President is left behind. Some time later Hyper Metal Sonic starts attacking the Land of the Sky and the President mistakes it for Sonic. To make sure that it's actually him he has his aide contact Sonics house. Sonic isn't there but Knuckles and Tails are, and they explain to him that that the one attacking the Land of the Sky is actually a robotic clone. When he hears Hyper Metal Sonic plans to destroy the Ice Cap and launch the Land of the Sky into space he makes a pact with Knuckles and Tails to do whatever is necessary to stop him. He takes his personal airplane and picks up Old Man Owl, who was still on Sonic's Island, and they head off together to try and stop Hyper Metal Sonic. Unfortunately their airplane crash lands and the two are rescued by Hyper Metal Sonic, who turned sides, much to the suprise of everyone. This page was last edited on 30 September 2011, at 14:59.